How should evaluators assess the risk of individuals convicted of offences motivated by extreme political, religious or ideological views? Although relatively rare, Canadian correctional systems have always had to manage offenders whose crimes were primarily motivated by extreme political, religious or ideological views. Attention to this problem has been heightened in recent years by the international activities of terrorist organizations, which may have influenced hate crime activities in Canada. Risk assessment procedures for “typical” offenders are well developed. Research has identified the major risk factors for general and violent recidivism, and these risk factors have been combined into scales. Empirically validated risk scales are now routinely used with almost all offenders in the federal, provincial and territorial correctional systems. It is not clear, however, that the risk assessment procedures developed for routine offenders will work with violent extremists. The existing risk scales focus on factors such as a history of crime and violence, lifestyle instability, poor attachment to work and school, and substance abuse. In contrast, violent extremists often have highly disciplined lifestyles, with little or no criminal history. Consequently, they would be expected to appear “low risk” on the existing scales even when they remain committed to the use of violence to advance their causes. Given the above concerns, there is a need to develop risk assessment procedures appropriate to this atypical group of offenders. A literature review was conducted examining the similarities and differences in the risk factors for violent extremism compared to the risk factors for violence displayed by typical criminal and psychiatric populations. The research on violent extremism is much less developed than the research on general criminal violence. Most of the knowledge comes from retrospective case studies of individuals or radical groups. Nevertheless, the available research does indicate that there is relatively little overlap in the risk factors for general criminal violence and for violent extremism. The major predictors of engagement in violent extremism are attitudes justifying violence, dehumanization of identified targets, and rejection of peaceful, democratic means of resolving injustices and historical grievances. The likelihood of violent extremism increases in individuals who have already taken steps towards violent actions (e.g., non-state sponsored military training) and those who are embedded in social networks supporting violent extremism. The major risk factors for violent extremism were organized into a structured risk assessment protocol (Violent Extremism Risk Assessment; VERA). The VERA is intended to structure the professional judgement of evaluators. Given the limited available research, another goal of the VERA is to focus future research on promising risk factors. The risk assessment protocols developed for routine offenders are unlikely to accurately measure the risk of violent extremists. Consequently, evaluators need to consider risk factors specific to violent extremism. Correctional systems will need to develop distinct policies and procedures for managing violent extremists. Given their unique risk factors, standard correctional programs are unlikely to meaningfully influence the recidivism risk of violent extremists. 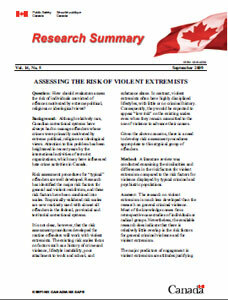 Further research is needed on the risk factors associated with violent extremism. This research would include case studies of those who have engaged in violent actions, as well as empirical studies of the much larger population of individuals who support violence as a means of advancing their causes. Pressman, E. (2009). Risk Assessment Decisions for Violent Political Extremism. User Report 2009-02. Ottawa: Public Safety Canada.